There’s a saying health is wealth. So, for an individual, it’s very important to work hard, do exercises to stay fit and healthy. There are many gadgets which help us to monitor our body fitness. Some of them are listed below. I. Fitbit Aria: It is a smart device to scale your health and fitness and keeps you on track. It can track the body mass index (BMI), weight and body fat percentage. It displays easily understandable weight stats and progress trends on a single dashboard of the app synced with the device through your home Wi-Fi network. It also recognises up to eight users and keeps their results private. It allows the user to set goals and use the calorie coaching. It has a sleek design having a polished glass surface suitable for every home. II. Fitness Bracelet: It is otherwise called as fitness wristband or health band. This smart band is wearable at the wrist which is synced with your smartphone app. It can measure the blood pressure after a heavy workout or on a daily basis. Further, it is capable of tracking heart beat rate continuously all day and night. It also tracks distance and steps covered, calories burnt and time taken. It’s made of up a waterproof material which allows the user to wear while swimming. It also tracks your sleep i.e. how long and how well you sleep. Moreover, few bands have Vibration alerts for calls, SMS and alarm notifications. III. Body Media’s Adhesive Patch: Body Media Patch is the first use and throws wearable device which monitors and tracks the number of calories burnt, sleep patterns and hours and activity levels over a period of 5-7 days. 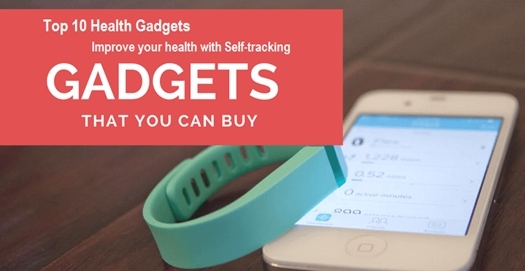 It is an economical solution which tracks habits of an individual’s lifestyle. It is designed to be worn on your upper arm and is waterproof so that you can wear it while bathing or taking a shower. It’s much smaller than your own palm. It evaluates the user’s health and assists healthcare practitioners. It also can adjust fitness and sports training. IV. Withings Body Cardio: It is a device to monitor overall cardiovascular rate and analysis the full body composition. It tracks BMI, weight, body fat, bone mass and water content of the body with accuracy. It has the ability to assess the heart beat rate and pulse wave velocity which gives a complete picture of cardiovascular health. Data from every measurement is synced to health mate app in your smartphone via Wi-Fi. It also displays the local weather forecast. And it can measure stats up to 8 users at a time. V. Tell spec Food Scanner: It is a portable scanner that tests the quality of food, how safe the food to be consumed is and identifies food allergens and chemicals. It is built on basis of “extensive food database of reference spectral scans”. It supports scanning of vast data gathering on authenticity and quality of food from the farm to your spoon. It monitors food contamination and food adulteration and makes the consumers aware of health issues on consumption of this food. VI. Blood Pressure Monitor: It’s a device to measure the blood pressure of an individual. The digital monitor is easy to analyse and take the readings. It generally comes with “WHO blood pressure classification index”. Some types are capable of detecting irregular heartbeats. The device comes with a large LCD display and automatic deflation and inflation and also a low-level battery indicator. Generally, it has pulse measurement range of 180 beats per minute and accuracy of 3 mm Hg. Also, it has up to 4 users interface. VII. Gadget for Weight Loss, Fat Burn and Asthma Relief: Nowadays science has gone so far that we have a portable gadget which helps in reducing weight, burn calories and is also effective in relief for asthma. It is needed to be exercised every day for lungs which will pump enough oxygen in the bloodstream thus improving body metabolism. Further, it rapidly oxidises fatty tissue which ensures you are fit and healthy. It is otherwise a continuous and slow breathing resistance exercise. It also reduces insomnia and snoring. VIII. Nivia Ball Pump Double Action: It is designed as a portable ball pump used to inflate a deflated ball efficiently within no time. It comes in compact and fittable pocket size offering double action i.e. push and pull technology. It is capable of pumping air both on upstroke and down stroke. It’s a quick and simple process to inflate basketballs, footballs, handballs and volleyballs. It is a sporting gear which ensures that your sports ball stays in perfect condition for the game. IX. Tractor for Cervical Spine Portable Neck: It is a device for the comfort of the neck and spine. It is useful for relaxation of your cervical spine. It can be used anytime and anywhere as it is portable. It is much needed for those IT people who sit at the office in front of the computer for a long time who tend to develop back problem in near future. It can lessen the symptoms and has no side effects. The device consists of an airbag, plastic attachment, valve of the tractor, the conduit, the inflatable ball, line bushing and the nylon base. X. Adjustable Magic Back Pain Relief Lumbar: It is a device which comes with removable cushion very much effective in reducing back pain. It is an easy to use and convenient preventative. It is efficient in relieving back pain caused due to tight muscles, poor spinal alignment due to improper stretching of muscles and ligaments. It can be adjusted for optimum stretching and has a cushion for additional comfort. It is generally used twice a day for a time interval of 5 minutes which will heal your back pain. Further, it increases body flexibility, the range of motion and body posture. So, these are the 10 gadgets which help an individual to track his health fitness and makes him aware of his degrading health. The links to buy those products are also given at the end of the description of each gadget.